2011 Certified Football sticks to the benchmarks that's made the brand popular for several years. 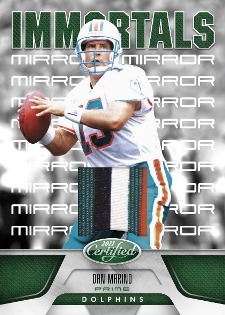 Numbered Mirror parallels and memorabilia programs like Shirt Off My Back and Fabric of the Game return. 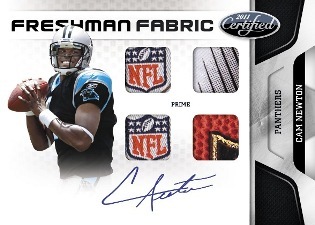 For the first time in the brand's history, autographed Freshman Fabric rookies will feature on-card signatures. Collectors can also be on the lookout for Platinum Hot Boxes where all the base cards have been replaced with Mirror parallels. Each box has at least two New Generation rookie cards numbered to 999 or less. 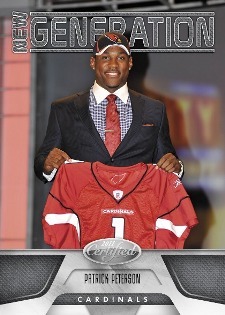 Freshman Fabric rookie cards numbered to 499 or less. 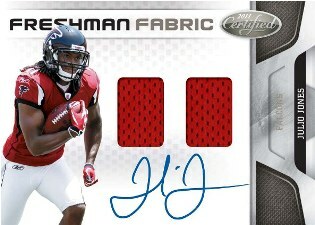 Freshman Fabric Autographs will feature on-card signatures for the first time in the brand's history. At least one Mirror parallel numbered to 250 or less inserted in every box. 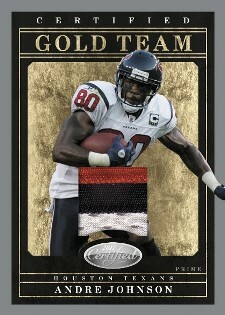 Mirror Material Gold, Emerald and Black cards include premium swatches and/or autographs. All are numbered to 25 or less. 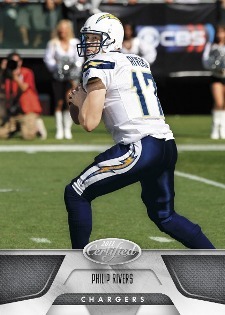 Random Platinum Hot Boxes include all Mirror parallels instead of base cards. Inserts and hit configurations stay the same. Returning memorabilia inserts include Shirt Off My Back and Fabric of the Game. Set includes autographs from such legends as Dan Marino, Emmitt Smith, Joe Namath and Barry Sanders. I broke 2 boxes of the product andI’m kind of torn. My “Alpha Hit” from box 1: Andy Dalton dual-1/C swatch auto RC. Box 2: 3/C auto-patch Jim Kelly “Immortals” /25. I pulled a 2nd auto, that of a lineman, from the box that yielded the Dalton. 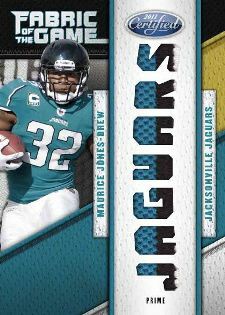 My other pulls were 1/C swatches that we all know sell for perhaps $3-8 on the 2ndry market. I love the committment Panini has demonstrated in raising the bar with regard to bang for buck and innovative, fresh designs. However, I was extremely disappointed to pull 5 single-color swatches out of a combined 8 hits, the other hits being autos.